Gerry Mallon, MC of The Laughter Lounge. 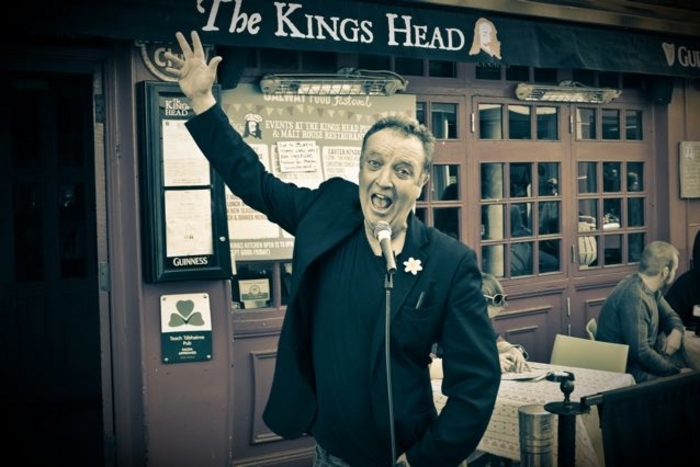 A COMEDY AND arts festival institution, Gerry Mallon’s Laughter Loft in The Ruby Room, The King’s Head, returns for lunchtime laughs on this month. The line-up for the first week is John Colleary (The Savage Eye ), Monday July 14; Eleanor Tiernan (Irish Pictorial Weekly ), Tuesday 15; Kevin Gildea (The View ), Wednesday 16; Neil Delamere (The Blame Game ), Thursday 17; Joe Rooney (Fr Ted, Killnaskully ) Friday 18; Karl Spain, Saturday 19; Lads Of Comedy, Sunday 20. The second week is Gearoid Farrelly (Today FM ), Monday 21; Chris Kent, Tuesday 22; Foil Arms and Hog, Wednesday 23; Neil Delamere, Thursday 24; Jarlath Regan (Russell Howard’s Good News ), Friday 25; Colm O’Regan (Ireland’s Got Mammies ), Saturday 26; and Patrick McDonnell (Fr Ted ), Sunday 27. Doors are at 12.30pm. The show starts at 1pm. Tickets are €10 and available on the door only. Spaces are limited so early booking is strongly advised. Page generated in 0.0936 seconds.